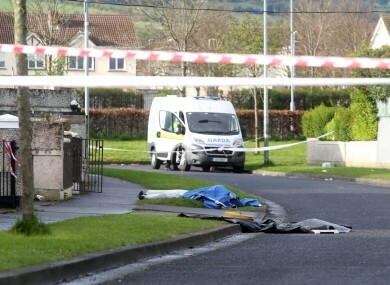 GARDAÍ FEAR THAT a man killed in a hit-and-run in Tallaght last night may have been targeted. The man, father of three Stephen Lynch (32), was killed around 7pm last night at Brookview Close in the west Dublin suburb. He was struck by a car, the driver of which subsequently fled the scene on foot. It is understood that he had received injuries before being struck by the car. Gardaí believe that he was run over a number of times. At a press briefing today, the gardaí said that Lynch was not involved in criminality. They said it was too early in the investigation to say exactly what had happened or how many people were involved, as they are still trying to establish the exact circumstances. They are trying to trace the movements of two cars: a silver Ford Focus, registration 10-WW-1812 which was left at the scene, and a red VW Polo registration 01-D-9539. Gardaí are trying to establish what brought Stephen Lynch to the area, and what his activities were while he was there. They also want to find out more about who he interacted with while he was there. Gardaí have appealed for witnesses to the incident to contact them at Tallaght Garda Station on 01 6666000, on the Garda Confidential Line on 1800 666111, or at any Garda station. Email “Tallaght hit-and-run killing victim named as father of three Stephen Lynch (32)”. Feedback on “Tallaght hit-and-run killing victim named as father of three Stephen Lynch (32)”.